A billionaire gang headed by Bill Gates and Eli Broad wants to convert America’s public schools, with its $600 billion in annual public expenditures according to the Department of Education, into a corporate-owned test-score factory. Their plan faces teacher resistance, and nowhere more so than in Chicago, where a feisty new leadership is making the Chicago Teachers Union among the most effective in the country. The billionaires have decided to go toe to toe with CTU and with Illinois’s 200,000 unionized teachers. The battleground is the state legislature and a draft bill called the Performance Counts Act. The bill would gut teachers unions, maximize the firing of teachers at will, and ensure that no organized voice remains to advocate for quality public schools. The repercussions for all public employees—and all of organized labor—are clear. 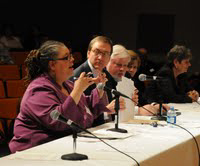 Chicago Teachers President Karen Lewis speaks out against the “Performance Counts Act” at a hearing of Illinois’ Special Committee on Education Reform. On her right is Daniel Montgomery, Illinois Federation of Teachers president. Photo: CTU. Last October, journalists noticed that candidates for Illinois legislative seats were receiving unusually large checks. “It’s not every day that a group almost nobody has ever heard of gives $175,000 to a single state legislative candidate,” remarked an Illinois Times contributor. Another reporter observed that “a national education reform group has quietly dumped more than $600,000 into key Illinois legislative races.” He added that “the source of much of that money is a mystery,” because of the unusual path it took to arrive in Illinois. The mysterious political action group is called Stand for Children. Based in Portland, Oregon, and with affiliates in seven states, SFC is an enormously well-funded and sophisticated “grassroots” organization whose largest single funder is Bill Gates: he gave the group nearly $3.5 million in 2010. The vision it chose, though, is in sync with that of the billionaires and politicians who today are driving school “reform” in America: blaming teachers for educational problems that inevitably result from slashed budgets, unemployment, and poverty; subjecting children to dreary regimens of standardized tests; stripping teachers of job security and tying their pay and future employment to their students’ test scores; and diverting public funds into charter schools and contracting out of services. While SFC materials generally avoid the subject of unions, or imply a friendly collaboration with them, SFC is fiercely anti-union, especially when the unions do not endorse its notion of school reform. The group promotes Geoffrey Canada—Harlem education entrepreneur and hero of the documentary movie “Waiting for Superman,” in which teachers unions are the scourge of education. Canada was SFC’s first board chair. SFC’s legislative achievements include Arizona’s SB 1040, which ties teacher pay partly to student test scores. With its current initiative in Illinois, however, SFC is trying out its most virulent strain of anti-teacher union tactics yet. Teachers’ performance evaluations would be closely linked to standardized test scores, an historically poor measure of learning. With a single unsatisfactory evaluation, a tenured teacher could be returned to probationary status or dismissed. A teacher with three unsatisfactory evaluations within a 10-year period would be dismissed and could never teach again in Illinois schools. Unions would be prohibited from bargaining over a broad scope of issues affecting student and teacher welfare—contracting out; layoffs, reductions in force, school closures; class size and class staffing; length of the school day or work day; pilot and experimental school programs; use of technology. Unions could not even bargain over the effects of these policies on members or their students. Teachers’ right to strike would be virtually nonexistent, and an unlawful strike could mean the union’s decertification. Stand for Children claims to offer hope, particularly to poor students and children of color who are widely denied access to quality and equitable education. Ironically, it is the children of poverty who stand most to lose because of SFC and its wealthy backers. Their agenda defunds public schools, and, as education historian Diane Ravitch points out, the charter school alternatives have a lower commitment than public schools do to serving the neediest students—academic poor performers, students with learning disabilities, or English language learners. Finally, the billionaires seek to weaken, if not destroy, the organizations that are best equipped to fight for quality public schools. Case in point: CTU is Chicago’s lead organizer against school closures, mass firings of teachers, and slashed school budgets. Teachers and supporters of public education, beware: the fight in Illinois against the billionaire gang’s initiatives may well be yours in the year to come. Cross-posted from the “Arguing the World” blog at Dissent magazine. That, in a nutshell, is my standard of celebrity activism done right. Ineffective celebrity activists…well, they do all sorts of things wrong. But, most fundamentally, they approach issues without any awareness of or connection to social movements. They might still have noble intentions, but they can end up being a net negative for social change efforts. Given our age of commodified dissent, I’m not interested in trying to determine who counts as truly rebellious and who doesn’t. But I think Easterly makes some important points. First, he notes that Lennon paid a real price for his antiwar stances. The FBI tracked his activities, and he fought for years with immigration officials in the Nixon administration who were set on deporting him from the United States. Bono, on the other hand, has turned up to dine in the White House, schmoozing with elites even while encouraging them to do more for the poor. In other words, his activism hasn’t cost him much. To me, this isn’t a problem in and of itself. But it is a symptom of much larger shortcomings in Bono’s approach. Rather than putting his focus on publicizing and legitimizing social movement leaders (those in the Jubilee debt relief movement, for example), Bono has put himself in a leadership role. He acts as a spokesperson, brandishes his supposed expertise, makes demands, negotiates, and accepts compromises. All these are things that should rightly be done by social movements and by representatives accountable to democratic structures within those movements. Ultimately these people should be accountable to those directly affected by the issue at hand. Absent any such structures, Bono has left himself vulnerable to cooptation. [Lennon] was a moral crusader who challenged leaders whom he thought were doing wrong. Bono, by contrast, has become a sort of celebrity policy expert, supporting specific technical solutions to global poverty. He does not challenge power but rather embraces it; he is more likely to appear in photo ops with international political leaders—or to travel through Africa with a Treasury secretary—than he is to call them out in a meaningful way…. The singer appeared onstage with Bush at the Inter-American Development Bank in Washington in 2002 as the president pledged a $5 billion increase in foreign aid. In May of that year, Bono even toured Africa with Bush’s first Treasury secretary, Paul O’Neill, fully aware that the administration was capitalizing on his celebrity. While I appreciate Lennon’s artistic contributions, he would still not be my model for celebrity activism. That would be someone like Harry Belafonte, who was a steadfast supporter of the civil rights and anti-apartheid movements, among other causes. Even at the peak of his fame, Belafonte could be relied upon to turn out at rallies and lend his magnetism to events. In just one of many notable instances, he played an important role in bankrolling the Student Nonviolent Coordinating Committee (SNCC) during 1964’s Freedom Summer in Mississippi. Not only did his funding provide a lifeline for activists in the South, his ongoing presence with the civil rights movement helped make it a fashionable cause for other donors, volunteers, and public figures. Now in his eighties and less well known than he was in the 1960s, Belafonte nevertheless remains active, advocating for the people of Haiti and speaking at the recent One Nation rally. All this has earned him a page of scorn on David Horowitz’s DiscoverTheNetworks.org, a site dedicated to tracking and defaming the Left. Not to put too fine a point on it, but looking at Horowitz’s site, I notice that he didn’t make a page for Bono. But local members of the NAACP disagree, and they’ve got professional historians on their side: It is an undeniable fact that South Carolinians seceded to protect their right to own slaves. ”This is nothing more than a celebration of slavery,” observes Lonnie Randolph, president of the state NAACP chapter. He led a downtown march and a candlelight vigil outside the municipal auditorium where the ball was to be held. Candlelight vigils and costumed waltzes get headlines, but Monday night was just one more showdown in another civil war, one that has raged in Charleston since 1865. When the city fell to the Union army that year, local freedpeople staged public demonstrations to mark slavery’s end. Huge crowds of former slaves paraded through city streets, even conducting a mock slave auction and displaying a hearse that proclaimed, “Slavery Is Dead.” African Americans in Charleston also built a cemetery for Union soldiers who had died as prisoners of war, and they came by the thousands to its dedication. Meanwhile, white Charlestonians worked to memorialize slavery’s most vocal champion, John C. Calhoun, who had died in 1850. In 1887, after a 30-year campaign, they installed a monument to Calhoun in Marion Square, the park at the very heart of the city. Rendered powerless by Jim Crow laws in the 1880s and ’90s, the city’s black residents could do nothing to prevent the memorialization of the man who had worked hard to keep them in chains. So for decades they subjected the monument to an informal campaign of ridicule and defacement. Even after the original statue was replaced by a second, which stood atop an enormous column, it continued to be vandalized. More recently, controversy has swirled around an effort to erect a monument to Denmark Vesey, a free black executed for plotting a slave rebellion in the city in 1822. Local black activists first proposed the tribute in the 1990s so that the city would acknowledge the centrality of slavery to its past. They also hoped the Vesey Monument would force Charlestonians to confront the reality that slaves were unhappy, so much so that they might violently rebel. Resistance to the monument has been formidable. Local whites have offered the standard litany of excuses about the marginal role, and benign nature, of slavery. Ground on the memorial was finally broken in February 2010, but only after opponents had prevented the statue’s placement in Marion Square. The Denmark Vesey Memorial will stand in Hampton Park, far from the Calhoun Monument, far from the city’s historic district, far from the eyes of millions of tourists. Calhoun’s likeness, standing just a block away from where revelers will celebrate secession Monday night, embodies white Charleston’s preferred method of dealing with its slave past: denial. Dedicated to a man who called southern slavery “a positive good,” the monument honors Calhoun’s commitment to truth, justice, and the Constitution. It says nothing about slavery. Despite the efforts of black Charlestonians and their white allies, slavery has been confined to the margins of the city’s public memory. The NAACP protest against the Secession Gala is a bid to bring it front-and-center. The shelling of Fort Sumter opened a long and painful civil war. Let’s hope that this latest exchange of salvos—another confrontation with repercussions far beyond Charleston—will instigate a different sort of civil process. The nation must attend to the pain of its history and the pain that the denial of that history continues to inflict. For after the band stops playing and the gala ball comes to a close, one fact will remain: Charleston’s protracted civil war is our own. We received this from the United Electrical Workers International department. Click Here to read the entire newsletter. Mexican Labor News and Analysis (MLNA) is produced in collaboration with the Authentic Labor Front, Frente Auténtico del Trabajo (FAT) of Mexico and the United Electrical Workers (UE) of the United States. For many of our stories, we rely on La Jornada’s excellent labor and social movement coverage. We also, of course, look at other Mexican and U.S. media, but most important is the coverage of La Jornada, to which we constantly refer and which we frequently summarize in our articles. In recognizing our sources, articles by David Bacon and John Ross periodically enliven our pages and less frequently, though no less appreciated, are pieces by Fred Rosen. We also appreciate IRC’s willingness to allow us to include articles by Laura Carlsen, director of the IRC Americas Program in Mexico City and occasionally by other IRC contributors. Most important, our collaborators in the Authentic Labor Front (FAT) keep us updated about the FAT’s organizing campaigns and other activities. The Solidarity Center in Mexico kindly sends us regular mailings dealing with labor unions and other issues. We also receive mailings on important issues from CITTAC in Tijuana, from Enlace, and others. Occasionally some of our readers travel to Mexico and send us reports regarding other developments. For information about submission of articles and all queries contact editor Dan La Botz at the following e-mail address: <mailto:danlabotz@cs.com>danlabotz@cs.com or call (513) 861-8722 The mailing address is: Dan La Botz, Mexican Labor News and Analysis, 3503 Middleton Ave., Cincinnati, OH 45220. Can you reprint these articles? Staff: Editor, Dan La Botz. Managing Editor, Robin Alexander. On March 25, 1911, a fire swept through the Triangle Shirtwaist Company. The bosses had locked the doors; the fire escapes broke. Within the hour 146 immigrant workers—mostly women–were dead. The Triangle fire galvanized a national social justice movement to protect workers’ health and to build unions. The anthology of poems is organized to tell the story of the fire chronologically: the first group of poems deals with the fire itself and those who died, those who survived, and those who witnessed. The next group of poems describes identifying the bodies and the funeral. The third section describes the trial and organizing for new laws to make it safe to work. The last group of poems looks back at the fire years later. These poems tell a dramatic, gripping story in a way that actors or poets can producer readers’ theater or poets’ theater to engage the audience in the Fire. This book of poetry commemorates the 100th anniversary of this fire that rocked New York. The poetry here remembers this tragedy that it may not be forgotten, that the conditions that caused this conflagration are not recreated, that the event is stamped upon history, that the necessity of unions is remembered, and that each life lost in the fire is valued. A few days after the Triangle fire in 1911 Yiddish poet Morris Rosenfeld published in Yiddish his “Memorial to Triangle Fire Victims” on the front page of the Jewish Daily Forward. After a few years American poets forgot about the fire, forgetting for 55 years. When editor Julia Stein was a young poet in 1980 writing poetry about her grandmother’s generation of immigrant garment workers, she first wrote about the Triangle Factory fire inspired by Morris Rosenfeld’s poem. Then through the work of literary critics Janet Zandy and Karen Kovacik, Stein discovered a new post-1980s generation of poets writing about the Triangle fire. These new Triangle poets are Chris Lllewellyn (1981); Mary Fell (1984); Hilton Obenzinger (1989); Carol Tarlen (1996), Ruth Daigon (2001); and Alice Rogoff (2010). Some of these poets’ Triangle poetry won major poetry prizes: Llewellyn’s book won the Whitman Award for Poetry while Mary Fell’s won the National Poetry Series. These poets attack the sweatshop, recapture the lives of immigrant women and of women workers, and inscribe workers’ lives and tragedies into literature. These poets have reacted to the post-1980 growing inequality in the United States with their Triangle fire poetry. The poems here are only a small selection of 100 years of literature about Triangle fire: a growing body of poetry, novels, dramas, and performance pieces. This small group of American poets is producing a new American poetry: public, historical, and engaged with society. 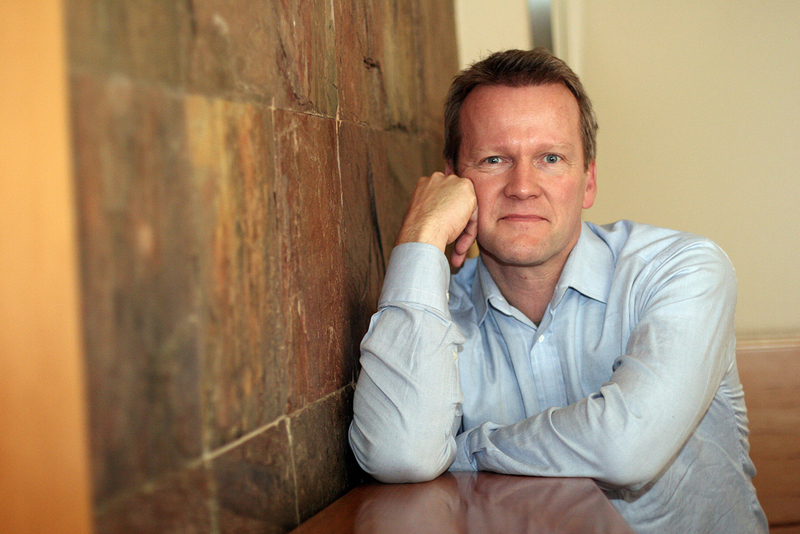 Justin Snider of The Hechinger Report sat down today with Dr. Pasi Sahlberg, Director General of the Centre for International Mobility and Cooperation in Finland’s Ministry of Education and Culture. An edited version of their conversation follows. Sahlberg, who has trained teachers, coached schools and advised policymakers in more than 40 countries, is also a former Washington-based World Bank education specialist. Earlier this week, Finland was once again among the top-scoring nations on the Programme for International Student Assessment (PISA), an exam given to 15-year-olds around the world. U.S. students were in the middle of the pack for science and literacy but below average in mathematics. The Hechinger Report: Two Million Minutes, a recent documentary by Bob Compton, reveals that American students spend significantly less time learning than their counterparts in India and China. But in your work, you’ve indicated that increasing instructional time isn’t necessarily a good idea. Why? Sahlberg: There’s no evidence globally that doing more of the same [instructionally] will improve results. An equally relevant argument would be, let’s try to do less. Increasing time comes from the old industrial mindset. The important thing is ensuring school is a place where students can discover who they are and what they can do. It’s not about the amount of teaching and learning. The Hechinger Report: Given your reservations about things like standardized testing, choice and competition, I’m wondering how you’re received in the U.S. Are you loved by teachers but loathed by some reformers? Sahlberg: The reception has been very positive everywhere. The thing is that everyone has exactly the same goal – good schools for all – but there are disagreements on how to get there. What I want to do is challenge people to see that things can be done differently. In Finland, we’ve gone from having a very poor system in the 1970s to what the recent McKinsey report called the only excellent system in the world. The Hechinger Report: How did Finland do it? Sahlberg: Most educational ideas that we are employing are initially from the U.S. They’re American innovations done in a Finnish way. You know, in the United States, there are more than enough ideas, there’s superior knowledge about educational change and you speak a language that has global reach. If you want to learn something from Finland, it’s the implementation of ideas. It’s looking at education as nation-building. We have very carefully kept the business of education in the hands of educators. It’s practically impossible to become a superintendent without also being a former teacher. … If you have people [in leadership positions] with no background in teaching, they’ll never have the type of communication they need. The Hechinger Report: So what do you make of the recent trend in the U.S. of hiring non-educators to run large urban school systems? Sahlberg: This is a very alien idea to Finns. … You know, a former head coach of the Chicago Blackhawks was Finnish, and when he returned to Finland, he was appointed director of one of the largest theaters – a completely different field. He left after one year. There was no buy-in. The Hechinger Report: What are your thoughts on the use of value-added data to measure teacher performance, which is quite popular in the U.S. at the moment? Sahlberg: It’s very difficult to use this data to say anything about the effectiveness of teachers. If you tried to do this in my country, Finnish teachers would probably go on strike and wouldn’t return until this crazy idea went away. Finns don’t believe you can reliably measure the essence of learning. You know, one big difference in thinking about education and the whole discourse is that in the U.S. it’s based on a belief in competition. In my country, we are in education because we believe in cooperation and sharing. Cooperation is a core starting point for growth. The Hechinger Report: Waiting for “Superman” put pressure on teachers’ unions in the U.S. And they’ve also come under criticism from some experts, reformers and the Obama administration. But others, like Linda Darling-Hammond of Stanford, have pointed out that top-performing countries such as Finland have strong teachers’ unions. So what do you make of teachers’ unions in the U.S.? Sahlberg: In Finland, unions aren’t an obstacle. Ninety-eight percent of teachers are unionized. And this is very important to the success of our system. I wouldn’t buy the argument that unions are a problem. 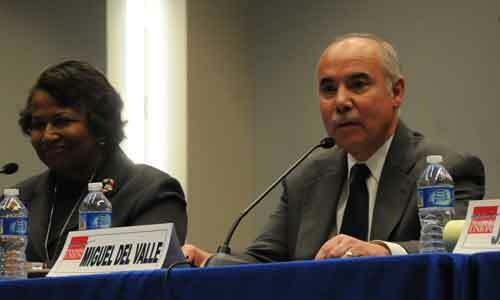 Chicago City Clerk Miguel Del Valle (above right) became the first mayoral candidate to reject the union busting legislation funded by corporate school reformers for Illinois. Above, Del Valle answering a question during the mayoral forum sponsored by the Chicago Teachers Union on December 16, 2010, the first day of the two days of hearings on the plutocrats' latest attack on public school teachers in the name of corporate "reform." Seated beside Del Valle above is Carol Moseley Braun, also a candidate for mayor who took part in the December 16 CTU forum. Substance photo by George N. Schmidt. legislation was pushed into the lame duck legislative session in Springfield after House Speaker Michael Madigan created a thing called the ‘School Reform Committee’ to fast track the legislation between now and January 6, 2011. Madigan’s enthusiasm for the latest iteration of corporate “school reform” came after a group called “Stand for Children”, based in Oregon, funneled more than $600,000 into the recent election campaigns between October 1, 2010 and November 2, 2010 (election day). Stand for Children, which only opened its Illinois office in December 2010, contributed $100,000 each in October 2010 to two Democratic legislators who are now on Madigan’s “school reform committee” — Jehan Gordon of Peoria and Keith Farnham. The group’s funding comes almost exclusively from some of the wealthiest people in the USA, although it claims to have a “grass roots” base, and the money that was poured into Illinois politics in October 2010 came from “Stand for Children” offices in Oregon and Massachusetts. When Substance tried to located the Illinois Stand for Children during the first week of December 2010, directory assistance said the group had no phone number in Chicago or Springfield. It is a “501c4” group, meaning it can distribute money without having to reveal the source of its dollars. Like “Advance Illinois,” which reportedly drafted the proposed act with Stand for Children, Stand for Children claims to be a non-partisan group that’s only interested in what’s best for children. But its ability to make campaign contributions far above anything ordinary teachers might make (Stand for Children was the largest contributor to the re-election campaigns of Jehan Gordon and Keith Farnham) stems from the fact that its money — like the money behind Advance Illinois — comes from millionaires and billionaires. Michael Madigan’s hastily formed “school reform” committee, which held hearings in Aurora Illinois on December 16 and December 17, 2010, featured “reform” groups, which are massively funded by corporations and foundations like the Bill and Melinda Gates Foundation. “Advance Illinois” and “Stand for Children” were given preferential treatment during the hearings by both the Democratic co-chair (Linda Chapa La Via) and the Republican co-chair (Roger Eddy), while actual grass roots local groups were snubbed and members of the committee (such as Karen Yarbrough) were allowed to launch into teacher bashing and union busting tirades during the hearings. 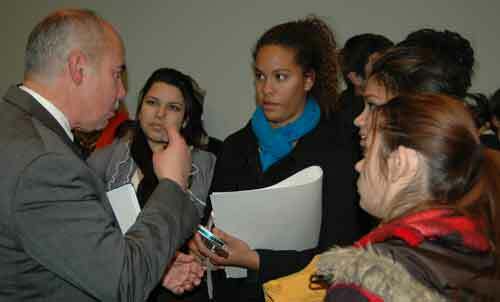 Chicago City Clerk Miguel Del Valle was interviewed following the Chicago Teachers Union mayoral forum by Steinmetz High School student reporters (left to right) From left, Steinmetz Star reporters: Eunice Dimas, Regina Crawford, Alyssa Sanchez, and Danielle Brumley. The reporters are from the Steinmetz Star, and award winning school newspaper from Steinmetz, a general public high school on Chicago's northwest side. Substance photo by Sharon Schmidt. Advance Illinois director Robin Steans (the millionaire sister of State Senator Heather Steans) gave the primary testimony on behalf of the bill on both days of the hearings. On the second day of the hearings, she was aided in her testimony by R. Eden Martin, who has been trying to force the privatization of Chicago’s public schools from his position as chairman of the education committee of the Civic Committee of the Commercial Club of Chicago. Read the rest of this story and Del Valle’s statement by clicking this link.